Members (from left): Dennis Roslansky, vocals and bass guitar (class of 1970), Gary Lekas, organist (class of 1970), Chris Inloes, vocals and lead guitar (class of 1971), Mike Thibeau, lead vocalist and bass guitar (sitting, class of 1971), Rocky Rockwell, vocvals and rhythmn guitar (class of 1970) and Bobby Lekas, drums (class of 1969). THE LINES END was a popular local band that toured Wisconsin and Illinois. All THE LINES END members were Case High school alumni. THE LINES END formed in 1967 with Bob Lekas, Rocky Rockwell, Mike Thibeau, Steve Harcus and Pat James. Dennis Roslansky and Gary Lekas joined in 1968, and Chris Inloes was added later that year replacing the late Greg Beth. The band possessed $9,903.00 worth of equipment by 1969, all of which was individually paid for. By 1969, all members of THE LINES END read music except Mike Thibeau. None have had any music lessons and all played by ear. Chris Inloes, Rocky Rockwell and Dennis Roslansky worked out the vocal arrangements by listening to records, then created a four-part harmony. In 1969 the group recorded and released a "45" record of two original songs "Hey Little Girl" by Rocky Rockwell (written for our 1971 classmate and his future wife JoAnn Roslansky) and "Miss Illusion" by Chris Inloes. The basic tracks for the single were recorded at Case High School in Miss Teske's (English teacher) classroom. The vocals were then added later at a local recording studio. The record got good local radio airplay and sold very well, especially at Case High School. The group has played in Chicago, Milwaukee, Sturtevant and at Northwestern university. Places in Racine area include The Sound, The Happening, The Nitty Gritty, The Wild Goose, The Inbetween Club, The Hulabaloo, Ivanhoe Club and a twice a month performance at The Release. They were also scheduled for Sophmore Girls Formal and other school dances. 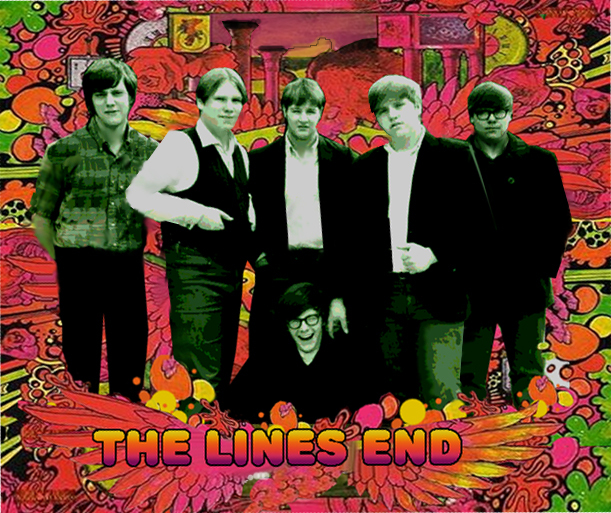 THE LINES END won the local Jaycee "Battle of the Bands" in 1969. On May 29, 1969 THE LINES END opened the show for the world famous band "The Byrds" at Memorial Hall.